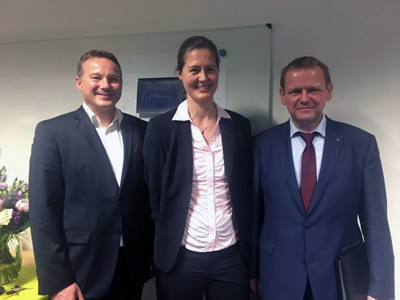 ICAMS group leader Rebecca Janisch from the Department of Micromechanical and Macroscopic Modelling completed her habilitation at the faculty of Mechanical Engineering. Her habilitation talk was dedicated to machine learning in materials science. Rebecca Janisch obtained her PhD at the Max Planck-Institute for Metals Research at Stuttgart, and was a PostDoc at the University of California Santa Barbara and TU Chemnitz. From 2006 to 2008 she was a research group leader at FAU Erlangen-Nürnberg. Since 2008 Rebecca Janisch leads the ICAMS research group Mechanical Properties of Interfaces. Her research interests cover topics like structure and properties of interfaces in materials, ab initio density functional theory and scale bridging approaches. ICAMS director A. Hartmaier, R. Janisch and R. Span, Dean of the Faculty of Mechanical Engineering (from left to right).